Overnight travel in Orlando will become a little inconvenient at the end of April as construction crews make changes to the interchange of Interstate 4 and the Florida’s Turnpike, according to Florida’s Department of Transportation. 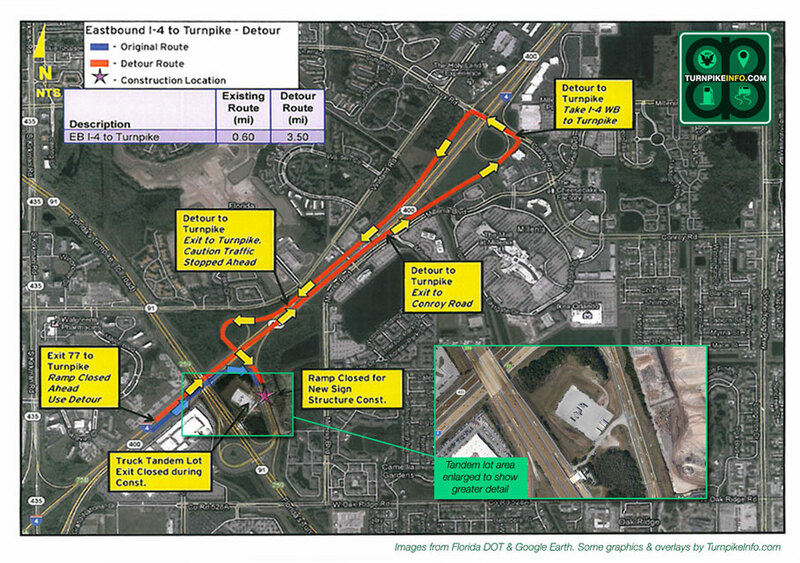 FDOT released a satellite map today showing the areas of detour, further announcing that some ramps from the turnpike to I-4 would be closed overnight April 27 through May 2. Additionally, truckers will have to abandon the tandem parking lot during the early morning hours on April 27 and 28 while new roadways signs are installed at the interchange. Deason noted that drivers on I-4 will still be able to get onto the turnpike. However, drivers traveling westbound on I-4 who want to get onto Florida’s Turnpike could experience delays from I-4’s Exit 77, she said. Truckers and haulers who normally can take advantage of the tandem trailer parking lot, which is adjacent to the turnpike ramps, will not be able to park overnight on April 27 and 28 because of the installation of new sign trusses. However, FDOT stated the overnight closures will only be effective between 1 a.m. and 5 a.m., and single trailers will still be able to access the lot from Interstate 4.